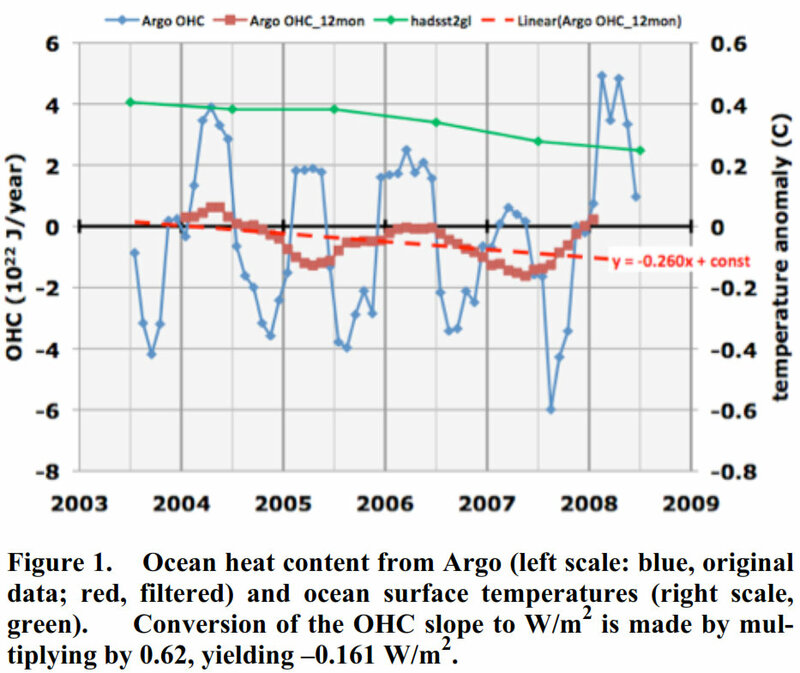 Climate scientist Roger Pielke Sr has posted today an in-press paper which demonstrates that ocean temperatures flattened in 2001-2002 and have been on a negative trend since. The ocean temperature trend is far more important than the hopelessly adjusted & flawed land temperature record to assess global warming, as noted by Dr. Pielke. During this period, CO2 levels have steadily climbed, which according to the IPCC should have caused a positive radiative imbalance resulting in about .16C warming. The fact that ocean temperatures have instead been cooling falsifies the entire anthropogenic global warming hypothesis. R. S. Knox, David H. Douglass 2010: Recent energy balance of Earth International Journal of Geosciences, 2010, vol. 1, no. 3 (November) In press doi:10.4236/ijg2010.00000." ABSTRACT: A recently published estimate of Earth’s global warming trend is 0.63 ± 0.28 W/m2, as calculated from ocean heat content anomaly data spanning 1993–2008. This value is not representative of the recent (2003–2008) warming/cooling rate because of a “flattening” that occurred around 2001–2002. 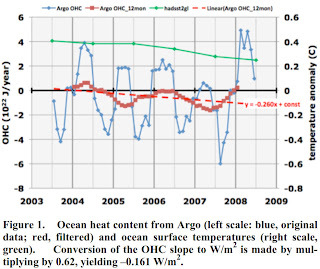 Using only 2003–2008 data from Argo floats, we find by four different algorithms that the recent trend ranges from –0.010 to –0.160 W/m2 with a typical error bar of ±0.2 W/m2. These results fail to support the existence of a frequently-cited large positive computed radiative imbalance. As many authors have noted, knowing FOHC [ocean heat content] is important because of its close relationship to FTOA, the net inward radiative flux at the top of the atmosphere. Wetherald et al. and Hansen et al. believe that this radiative imbalance in Earth’s climate system is positive, amounting recently  to approximately 0.9 W/m2. Pielke  has pointed out that at least 90% of the variable heat content of Earth resides in the upper ocean. Thus, to a good approximation, FOHC may be employed to infer the magnitude of FTOA, and the positive radiation imbalance should be directly reflected in FOHC (when adjusted for geothermal flux ; see Table 1 caption). The principal approximations involved in using this equality, which include the neglect of heat transfers to land masses and those associated with the melting and freezing of ice, estimated to be of the order of 0.04 W/m2 , have been discussed by the present authors . In steady state, the state of radiative balance, both quantities FTOA and FOHC should be zero. If FTOA > FOHC, “missing energy” is being produced if no sink other than the ocean can be identified. We note that one recent deep-ocean analysis , based on a variety of time periods generally in the 1990s and 2000s, suggests that the deeper ocean contributes on the order of 0.09 W/m2. This is not sufficient to explain the discrepancy. Trenberth and Fasullo (TF)  believe that missing energy has been accumulating at a considerable rate since 2005. According to their rough graph, as of 2010 the missing energy production rate is about 1.0 W/m2, which represents the difference between FTOA ~ 1.4 and FOHC ~ 0.4 W/m2. It is clear that the TF [Trenberth & Fasullo] missing-energy problem is made much more severe if FOHC is negative or even zero. In our opinion, the missing energy problem is probably caused by a serious overestimate by TF of FTOA, which, they state, is most accurately determined by modeling. youve made me feel so much better!